Area: 5,128 sq. km. (1,980 sq. mi. ), about the size of Delaware. Trinidad — 4,828 sq. km. (1,864 sq. mi). Tobago — 300 sq. km. (116 sq. mi). Cities: Capital: Port of Spain (metropolitan pop. 310,000). Other cities and boroughs — San Fernando, Chaguanas, Arima, Sangre Grande, Scarborough (Tobago). Annual population growth rate: 0.4%. Religions (2000): Roman Catholic 26.0%, Hindu 22.5%, Anglican 7.8%, Pentecostal 6.8%, Baptist 7.2%, other Christian 5.8%, Muslim 5.8%, Seventh Day Adventist 4%, other 10.8%, unspecified 1.4%, none 1.9%. Education: Years compulsory: 8. Literacy — 98.6%. Health: Infant mortality rate (2005 est.) — 25.81/1,000. Life expectancy (2006 est.) — 66 yrs. male; 68 yrs. female. Work force (620,800, first quarter 2008): Trade and services 62.9%, construction 18.9%, manufacturing 9.5%, agriculture/sugar 3.8%, oil/gas 3.3%, utilities 1.5%. Branches: Executive: president (chief of state), prime minister (head of government), cabinet. Legislative — bicameral parliament. Judicial — independent court system; highest court of appeal is Privy Council (London). Subdivisions: Nine regional corporations, two city corporations, three borough corporations, one ward (Trinidad); Tobago House of Assembly. Political parties: People's National Movement (PNM); United National Congress (UNC); Congress of the People (COP); other minor parties, including the Tobago Organization of the People (TOP), the Movement for Social Justice (MSJ), and the National Joint Action Committee (NJAC). GDP: U.S. $28.6 billion (current prices). Annual growth rate: 2.5% (2010 est. ); -3.5% (2009). Per capita income: U.S. $18,800 (2009 est., The Economist); U.S. $25,705 (2009 est., World Bank). Petroleum (oil, natural gas, petrochemicals): 42.5% of GDP. Financial services: 13% of GDP. Distribution including restaurants: 10.6% of GDP. Manufacturing (food and beverages, assembly, chemicals, printing): 8.4% of GDP (excludes oil refining and petrochemical industries). Construction and quarrying: 7.7% of GDP. Government services: 4.6% of GDP. Education, cultural community services: 2% of GDP. Electricity and water: 1.4% of GDP. Agriculture (sugar, poultry, other meat, vegetables, citrus): 0.4% of GDP. Hotels and guesthouses: 0.2% of GDP. Columbus landed on and named Trinidad in 1498, and Spaniards settled the island a century later. Spanish colonizers largely wiped out the original inhabitants — Arawak and Carib Indians — and the survivors were gradually assimilated. Although it attracted French, free black, and other non-Spanish settlers, Trinidad remained under Spanish rule until the British captured it in 1797. During the colonial period, Trinidad's economy relied on large sugar and cocoa plantations. Tobago's development was similar to other plantation islands in the Lesser Antilles and quite different from Trinidad. During the colonial period, French, Dutch, and British forces fought over possession of Tobago, and the island changed hands 22 times — more often than any other West Indies island. Britain took final possession of Tobago in 1803. The two islands of Trinidad and Tobago were incorporated into a single colony in 1888. Trinidad and Tobago achieved full independence in 1962 and joined the British Commonwealth. Trinidad and Tobago became a republic in 1976. The people of Trinidad and Tobago are mainly of African or East Indian descent. Virtually all speak English. Small percentages also speak Hindi, French patois, and several other dialects. Trinidad has two major folk traditions: Creole and East Indian. Creole is a mixture of African elements with Spanish, French, and English colonial culture. Trinidad's East Indian culture came to the island beginning May 30, 1845 with the arrival of indentured servants brought to fill a labor shortage created by the emancipation of the African slaves in 1838. Most remained on the land, and they still dominate the agricultural sector, but many have become prominent in business and the professions. East Indians have retained much of their own way of life, including Hindu and Muslim religious festivals and practices. The members of the House of Representatives are elected to terms of at least 5 years. Elections may be called earlier by the president at the request of the prime minister or after a vote of no confidence in the House of Representatives. Parliamentary elections took place on November 5, 2007; the number of seats contested in the House of Representatives in that vote increased from 36 to 41. The same number of seats were contested in the May 24, 2010 elections. The Senate's 31 members are appointed by the president: 16 on the advice of the prime minister, 6 on the advice of the leader of the opposition, and 9 independents selected by the president from among outstanding members of the community. Elected councils administer the nine regional, two city, and three borough corporations on Trinidad. Since 1980 the Tobago House of Assembly has governed Tobago with limited responsibility for local matters. The first political party in Trinidad and Tobago with a continuing organization and program — the People's National Movement (PNM) — emerged in 1956 under Dr. Eric Williams, who became Prime Minister upon independence and remained in that position until his death in 1981. Politics have generally run along ethnic lines, with Afro-Trinidadians supporting the PNM and Indo-Trinidadians supporting various Indian-majority parties, such as the United National Congress (UNC). Most political parties, however, have sought to broaden their appeal, and their candidate lists for the November 2007 and May 2010 parliamentary elections reflected this. The PNM remained in power following the death of Dr. Williams, but its 30-year rule ended in 1986 when the National Alliance for Reconstruction (NAR), a "rainbow party" aimed at Trinidadians of both African and Indian descent, won a landslide victory by capturing 33 of 36 seats. Tobago's A.N.R. Robinson, the NAR political leader, became Prime Minister. The NAR began to break down when the Indian component withdrew in 1988. Basdeo Panday, leader of the old United Labor Front (ULF), formed the new opposition with the UNC. In July 1990, the Jamaat al Muslimeen, an extremist Black Muslim group with an unresolved grievance against the government over land claims, tried to overthrow the NAR government. The group held the prime minister and members of parliament hostage for 5 days while rioting and looting shook Port of Spain. After a long standoff with the police and military, Jamaat leader Yasin Abu Bakr and his followers surrendered to Trinidad and Tobago authorities. In 1992, the Court of Appeal upheld the validity of a government amnesty given to the Jamaat members during the hostage crisis. Abu Bakr and 113 other Jamaat members were jailed for 2 years while other courts debated the amnesty's validity. All 114 members were eventually released after a ruling by the U.K. Privy Council. In 1991 elections, the NAR lost control of the government to the PNM, led by Patrick Manning who became prime minister. The Panday-led UNC finished second and replaced the NAR as chief opposition party. In 1995 Manning called for elections, in which the PNM and UNC both won 17 seats and the NAR won two seats. The UNC allied with the NAR and formed the new government, with Panday becoming prime minister — the first prime minister of East Indian descent. Although elections held in 2000 returned the UNC to power, the UNC government fell in 2001 with the defection of three of its parliamentarians, and the subsequent elections resulted in an even 18-18 split between the UNC and the PNM. President A.N.R. Robinson bypassed his former party colleague Panday by inviting PNM leader Manning to form a government, but the inability to break the tie delayed Parliament from meeting. Manning called elections in 2002, after which the PNM formed the next government with a 20-16 majority. Elections were held again on November 5, 2007, with the PNM winning 26 seats and the UNC securing the remaining 15; the Congress of the People party (COP) won no seats. Following the vote, Prime Minister Patrick Manning took his oath of office on November 7 to begin another term. In April 2010, however, the Prime Minister determined to dissolve Parliament early and elections were called for May 24. That vote pitted the PNM against a coalition known as the People's Partnership (PP) made up of the UNC and COP as well as some smaller parties, including the Tobago Organization of the People (TOP) and the Movement for Social Justice. The partnership emerged victorious with 29 seats against the PNM's 12 seats and Kamla Persad-Bissessar replaced Manning as Prime Minister, becoming the first woman in the nation's history to hold that office. All three major parties are committed to free market economic policies and increased foreign investment. Trinidad and Tobago cooperates with the United States in the regional fight against narcotics trafficking and on other issues. This positive and fruitful relationship has continued and grown stronger under the PP government. On August 21, 2011, following a weekend of violence including eleven murders, the government declared a state of emergency (SOE) which was extended by Parliament, expiring on December 5, 2011. The curfew accompanying the SOE was controversial and was eventually reduced. On November 24, 2011, the Prime Minister announced the government uncovered an assassination plot against her and several members of her cabinet. Ultimately, seventeen men were arrested under SOE rules, but all were released without charge on December 5 with the expiration of the SOE. Trinidad and Tobago experienced 16 consecutive years of real GDP growth through 2008 as a result of economic reforms adopted in the early 1990s, tight monetary policy and, until recently, buoyant markets for its export commodities. In 2007, the country experienced a real GDP growth rate of 5.5%, which moderated to 3.5% in 2008. The country experienced negative growth of 3.5% in 2009, with an expected rebound of 2.5% in 2010. The government largely avoided deficit spending throughout its history, but a high non-energy fiscal deficit raises concerns for long-term sustainability, while rapid increases in infrastructure and recurrent spending have contributed to rising inflation and the government's last three budgets increased the country's deficit significantly. The 2010 budget reflected an 11% increase in spending, and the government's spending seems generally unaffected by the state of the international market. Long-term growth prospects nevertheless remain promising, as Trinidad and Tobago further develops its oil and gas resources and the industries dependent on natural gas, including petrochemicals, fertilizers, iron/steel and aluminum. Additional growth potential also exists in financial services, telecommunications and transport. Strong growth in Trinidad and Tobago over the past few years has led to trade surpluses, even with high import levels due to industrial expansion and increased consumer demand. Unemployment reached 5.8% in December 2009, up from 3.9% in December 2008, and recent estimates indicate an unemployment rate of 6.7% in 2010. However, official rates likely mask a higher underemployment rate by counting participants in government make-work projects as employed persons. The inflation rate fluctuated in the last 24 months, settling at 5.1% in April 2010, but rising again to 14.1% in July, and then dropping again to 10.7% in early 2011. In an effort to contain inflation, the Central Bank repeatedly raised interest rates and reserve requirements, while issuing bonds to mop up excess liquidity. There are no currency or capital controls, and the Central Bank maintains the TT dollar in a lightly managed, stable float against the U.S. dollar. During 2008, the exchange rate fluctuated between TT$6.1573 and TT$6.3573 to U.S. $1. The rate as of August 2009 was TT$6.3401 to U.S. $1, but shifted to approximately TT$6.4 to U.S. $1 in the first quarter of 2011. During the 12-month period of July 2009 to July 2010, the average buying rate of the U.S. dollar appreciated from $6.2719 to $6.3239. Within the same period, the selling rate increased from $6.3367 to $6.3771. Trinidad and Tobago has made a transition from an oil-based economy to one based on natural gas. Natural gas production over the period October 2007 through April 2008 was 115.2 million cubic meters per day, up from 111.9 million cubic meters per day over the same period in 2006-2007. About half of the country's natural gas production is converted into liquefied natural gas (LNG) at the Atlantic LNG facility in Trinidad and exported under long-term contracts and on the spot market. Trinidad and Tobago is the fifth-largest exporter of LNG in the world and the single largest supplier of LNG to the U.S., providing two-thirds of all LNG imported into the U.S. since 2002, and currently supplying approximately 40% of U.S. LNG imports. Natural gas production continues to expand and should meet the needs of new industrial plants coming on stream over the next few years, including iron, aluminum, ethylene, and propylene. The petrochemical sector includes plants producing methanol, ammonia, urea, and natural gas liquids; after steady growth in recent years, this sector more than any other felt the impact of a global economic slowdown in late 2008. A number of plants responded with temporary shutdowns. Since 2010 the government has increased its commitment to the development of renewable energy sources by creating various tax credits and incentives for the import and maintenance of renewable energy equipment. Growth in the non-energy sector was projected to slow from 7.7% in 2007 to 4.8% in 2008, and took a 7.2% hit in 2009. The manufacturing sector grew by 2.5% in 2008, but contracted by 1.7% in 2009; it was expected to rebound to 8.4% of GDP in 2010. Services sector growth slowed to 4.5% in 2008 from 6.6% in 2007, and was projected to contract another 0.8% in 2010. An increase of 8.6% in 2008 was projected for the domestic agriculture sector in response to several government initiatives, but the government expected drops in 2009 and 2010 and that agriculture would contribute 0.4% and 0.5% of GDP, respectively. The government also is seeking to diversify the economy to reduce dependence on the energy sector and to achieve self-sustaining growth. The Ministry of Trade and Industry is leading efforts to develop seven other sectors where the country is believed to have a comparative advantage: yachting; fish and fish processing; merchant marine; music and entertainment; film; food and beverage; and printing and packaging. A national research and development fund will be established to stimulate innovation and investment in a new technology park, currently under construction. Trinidad and Tobago has an open investment climate. Since 1992, almost all investment barriers have been eliminated. The government has a double taxation agreement, a bilateral investment treaty, and an intellectual property rights agreement with the United States. The stock of U.S. direct investment in Trinidad and Tobago was $3.8 billion (book value) as of 2007. Total foreign direct investment inflows over the 4 years 2004-2007 amounted to approximately U.S. $3.8 billion, although foreign direct investment in Trinidad and Tobago has dropped significantly since 2008. Among recent and ongoing investment projects are several involving U.S. firms. Several U.S.-branded hotel chains have entered the market; most recently, a Hyatt-managed hotel opened in early 2008, part of a multimillion-dollar waterfront development project in Port of Spain. Trinidad and Tobago's infrastructure is adequate by regional standards. Expansion of the Crown Point airport on Tobago is being planned, which follows opening of the Piarco terminal on Trinidad in 2000. There is an extensive network of paved roads. Traffic is a worsening problem throughout Trinidad, as the road network is not well suited to the rising volume of vehicles and only a rudimentary mass transport system exists as an alternative. Utilities are fairly reliable in cities, but some rural areas suffer from power failures and water shortages in the dry season. Flooding in the rainy season due to inadequate drainage affects urban and rural areas alike. Infrastructure plans include housing, roads and bridges, rural electrification, flood control, and improved water supply, drainage, and sewerage. Telephone service is modern and fairly reliable, although significantly more costly to consumers than comparable U.S. service, including for wireline, wireless, and broadband services. Two wireless providers, bmobile and Digicel, are operational, and the use of cellular technology is widespread. Some portions of the country have not been penetrated by wireless Internet, but that service is increasingly common throughout the country. Improvements in service and price are likely as competition in the Internet services market increases in coming years. 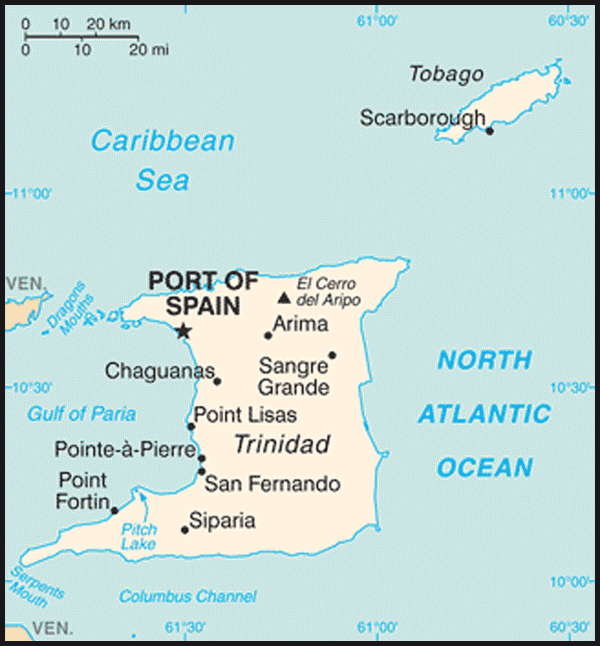 As the most industrialized and second-largest country in the English-speaking Caribbean, Trinidad and Tobago has taken a leading role in the Caribbean Community and Common Market (CARICOM), and strongly supports CARICOM economic integration efforts and has advocated for a greater measure of political security and integration. CARICOM members are working to establish a Single Market and Economy (CSME). In early 2006, Trinidad and Tobago, in conjunction with the larger CARICOM nations, inaugurated the CARICOM Single Market, a precursor to the full CSME. As a first step toward greater security integration, Trinidad and Tobago and the other members of CARICOM collaborated with the U.S. on an Advance Passenger Information System in preparation for the 2007 Cricket World Cup tournament, which took place in nine Caribbean venues in March and April 2007. 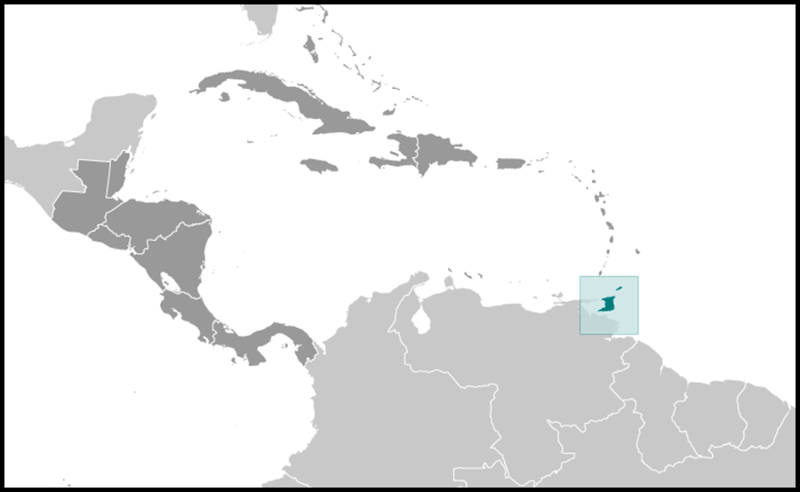 Trinidad and Tobago is active in the Summit of the Americas (SOA) process of the Organization of American States (OAS) and hosted the fifth Summit of the Americas in April 2009, attended by President Barack Obama. It has hosted hemisphere-wide ministerial meetings on energy, education, and labor, as well as an OAS meeting on terrorism and security, and plans to host a conference for female leaders in the region in 2011. It also hosted a negotiating session in 2003 for the OAS Free Trade Area of the Americas (FTAA) and campaigned to host an eventual FTAA secretariat. Trinidad also played host to the November 2009 Commonwealth Heads of Government Meeting. Trinidad and Tobago is a democracy that maintains close relations with its Caribbean neighbors and major North American and European trading partners. After its 1962 independence, Trinidad and Tobago joined the UN and the Commonwealth. In 1967, it became the first Commonwealth country to join the OAS. In 1995, Trinidad played host to the inaugural meeting of the Association of Caribbean States and has become the headquarters location for this 25-member grouping, which seeks to further economic progress and cooperation among its members. Relations with Latin American nations, including Venezuela, are generally cordial, despite the government's distaste for the Venezuelan PetroCaribe initiative. The United States and Trinidad and Tobago enjoy cordial relations. U.S. interests here and throughout the hemisphere include a focus on increasing investment and trade, and ensuring more stable supplies of energy. They also include enhancing Trinidad and Tobago's political and social stability and positive regional role through assistance in drug interdiction, health issues, and legal and security affairs. The U.S. embassy was established in Port of Spain in 1962, replacing the former consulate general. International Military Education and Training (IMET) and Foreign Military Financing (FMF) programs were suspended in 2003 under the terms of the American Service Members Protection Act (ASPA), because Trinidad and Tobago, a member of the International Criminal Court, had not concluded a bilateral non-surrender or "Article 98" agreement with the United States. However, when the Congress de-linked IMET funding from the Article 98 sanctions, a nominal allocation of $45,000 in IMET was reinstated for late 2007 and the program has since grown. Currently, the main source of financial assistance provided to security forces is through State Department's Bureau of International Narcotics and Law Enforcement funds, Traditional Commander's Activities funds, the State Partnership Program (with Delaware), and IMET. Assistance to Trinidad and Tobago from U.S. military, law enforcement authorities, and in the area of health issues remains important to the bilateral relationship and to accomplishing U.S. policy objectives. The U.S. Government also provides technical assistance to the Government of Trinidad and Tobago through a number of existing agreements. The Department of Homeland Security has a Customs Advisory Team working with the Ministry of Finance to update its procedures. Similarly, the Treasury Department had an Internal Revenue Service (IRS) advising team that worked with the Board of Inland Revenue modernizing its tax administration; this long-running project ended in October 2007. The U.S. Centers for Disease Control and Prevention (CDC), a part of the Department of Health and Human Services, collaborates with the Trinidad-based Caribbean Epidemiology Center (CAREC) and other regional partners to provide technical assistance and financial support for HIV/AIDS-related epidemiology surveillance and public health training in the region. U.S. commercial ties with Trinidad and Tobago have always been strong and have grown substantially in the last 10 years due to economic liberalization in the 1990s. U.S. firms have invested more than a billion dollars in recent years — mostly in the petrochemical, oil/gas, and iron/steel sectors. Many of America's largest corporations have commercial links with Trinidad and Tobago, and more than 30 U.S. firms have offices and operations in the country. Trinidad and Tobago is the leading beneficiary of the U.S. Caribbean Basin Initiative (CBI). The U.S. embassy actively fosters bilateral business ties. A double-taxation agreement has existed since the early 1970s. A tax information exchange agreement was signed in 1989, and a Bilateral Investment Treaty (BIT) and an intellectual property rights agreement were signed in 1994. The BIT entered into force in 1996. Other agreements include extradition and mutual legal assistance treaties, which have been in force since 1999. An agreement on maritime cooperation was signed in 1996. There are large numbers of U.S. citizens and permanent residents of Trinidadian origin living in the United States (mostly in New York and Florida), which keeps cultural ties strong. About 20,000 U.S. citizens visit Trinidad and Tobago on vacation or for business every year, and more than 6,500 American citizens are residents. The U.S. Embassy (http://trinidad.usembassy.gov/) is located at 15 Queen's Park West, Port of Spain (tel. 868 622-6371, fax: 868 822-5905).